For practitioners of change management, lean systems principles, and Six Sigma (the package often referred to as “Lean Six Sigma” although some firms call it something else, such as in this case) Honeywell is an interesting, real-time case study. “original Honeywell, which was largely concerned with controls and aerospace, was bought by Allied Signal, an aerospace, automotive and engineering firm which, though twice the size, took the Honeywell name for its greater public recognition. Melding the two firms proved hard. Under its legendary former boss, Larry Bossidy, Allied Signal had become obsessed with cost control, arguably at the expense of needed long-term investment. The original Honeywell, by contrast, had a reputation for being customer-centric and creative, but not terribly good at “execution”. The acquisition, in 2000, of Pittway, a home-security and surveillance firm, worsened the culture clash. It was not until the appointment of a new boss, David Cote, in 2002 that the modern Honeywell began to emerge. “has helped transform Honeywell from a troubled giant to one of America’s most successful companies. 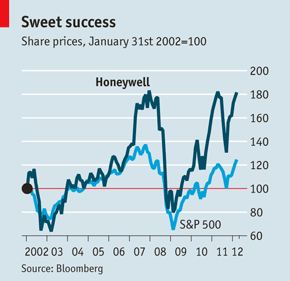 Honeywell’s sales in 2011 were 72% higher than in 2002, and its profits doubled to $4 billion. A new emphasis on generating cash also means the firm has more money in the bank for every dollar declared in profit. At the Lincolnshire plant, a short drive from Chicago’s O’Hare airport, managers credit the HOS with a huge improvement in productivity—without which, they say, it would have struggled to survive the recent downturn. It used to take 42 days to make and deliver a sophisticated toxic-gas detector, for clients including Intel and Samsung; now it takes ten. The production process used to consume the factory floor; now, it uses merely a quarter of it. This has freed up the rest of the factory to make lots of other products. The factory therefore makes more stuff, generating more revenue, with essentially the same headcount, square footage and energy consumption. That has got it to the HOS’s “bronze” level, along with another 100-odd of Honeywell’s roughly 250 factories worldwide. Its denizens are now striving for silver (alas, according to one of many progress and performance reports posted on the factory wall, it failed to meet its goal of doing so by December and is now aiming for June). Product quality has also improved at the factory. So has safety, which its bosses concede had not been anywhere near good enough. Last month a sign on the wall declared that it was 232 days, and counting, since working time was lost to an accident (apparently a minor one). This may be one reason why surveys of employees report a continuous improvement in job satisfaction, notwithstanding all those meetings. As a result of all of this effort, the financial results have, thus far, been very strong indeed. In addition to the HOS, Cote assessed the Honeywell business portfolio and sold off about 20% of the business that he reckoned were not strong players in strong sectors and then reinforced his remaining businesses through a series of about 70 or so acquisitions. “Honeywell has become a cautious acquisitor—understandably, given the difficult cultural legacy Mr Cote inherited. This, he says, required a “changed mindset about how to do a deal.” As a result, Honeywell now only considers making an acquisition with the potential to deliver immediate cost savings worth at least 6-8% of sales revenues. Mr Cote’s belief that it is better to get something right than to do it quickly also shaped the roll-out of HOS. After the initial template was created following the visit to Toyota, it was piloted in ten factories. After six months, it was found to work in half of them, so it was tweaked and tested in five more. Only when it was working well was it deployed more broadly. It is now in use in every Honeywell factory. It also took far longer than expected to get many factories to the bronze state of compliance; a lot have done so in the past two years. A big difference between bronze and silver seems to be the extent to which the factory is proactive in working with suppliers and customers to improve the production process. Quite what rising to the gold level might involve is a matter of debate. In an investor presentation in March, Honeywell executives talked about their businesses and their plans for the HOS.